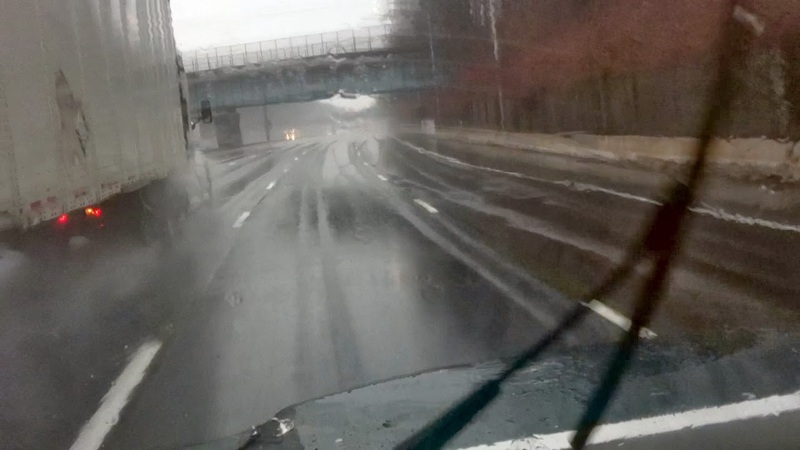 Now I don't mind driving in heavy traffic, or nasty freezing rain, or even towing a big trailer with an antique truck, but all at once, while dealing with the peculiarities of the Boston - Washington section of the I95. That makes for a long hard day. I took advantage of staying at Wal-Mart's, not ideal, but they're everywhere! and you can arrive really late. Had an interesting stay in Philadelphia, late at night, pouring rain, heavy traffic and my GPS sends me down an off ramp into industrial Philly! Trying desperately to get back on the Interstate while leaning out the window spraying windshield washer fluid from a squirt bottle, I pulled into a vacant lot to regroup. Turned out to be a Wal-Mart. not the greatest location but after an interesting chat with the lot attendant I figured it was OK. I did sleep but not much, yelling, screaming, tires screeching, Woo Hoo, Philly at night! Somewhere around New York I started hearing the familiar rumble of a U joint on the way out. I was determined to make it to Florida, meet up with Patrick and Jessica and swap it out at my leisure in sunny climes. Then just as I pulled out of a gas station in South Carolina, CRUNCH, and I couldn't ignore it any longer. lot which amused them and set off. Picked up my solar panels I'd had shipped to a very kind Land Rover enthusiast and west to find Patrick and Jessica.